Yoga and surfing, the two are often paired, and rightfully so, they are complementary to one another. Yoga surf camps are popping up all over the world and we are proud to offer Yoga surf holidays at our Caribbean surf camp. The reality of surfing, for beginners and experts alike, is that only about 10% of our time in the water is spent wave riding. 90% of our surf is usually spent either paddling for waves or sitting waiting for waves. While yoga will improve your balance, which will enhance your ability to ride waves, the true benefit of yoga for surfers is increased paddle strength and injury prevention. Unlike other training methods, yoga relies completely on one’s body weight to stabilize, stretch, and strengthen the body. The result is enormous strength gains in the small stabilizing muscle of the upper back and shoulders, the same muscles we engage to paddle. At Swell Surf Camp, we’ve created a list of The Best Yoga Poses for Paddle Strength, to give you the tools you need to prepare for your next surf holiday. Keep reading to learn the best yoga poses for surfers which will increase your paddle strength and turn you into a wave catching machine. Upward facing dog is one of the most recognizable yoga poses out there. When done properly, Upward Facing Dog will improve posture, strengthen the arms and wrists, stretch the chest, expand the lungs, firm the buttocks, and elongates the spine and abdomen. Begin in the pushup position or high plank position. Lower yourself down into the bottom of the pushup position while shifting your feet so that the tops of your feet are now facing the ground. From there, lift your chest off the floor and elongate your spine with a nice slow bend as your chest rises upwards. For surfers, this pose should feel natural as it essentially mimics the first step of a good pop up. Downward Facing dog is another recognizable pose that engages your paddling muscles and is a great addition to any surf warm up. Begin on the floor on your hands and knees. Your knees should be directly below your hips at the same width, your wrists should be under your shoulders at the same width. Spread your palms, keeping your index fingers parallel. Take a breath, as you exhale, lift your knees off the floor, keeping them slightly bent. Start to raise your tailbone to the sky. As you continue to breathe, push your quadriceps back and attempt to place your heels on the ground. The pose should be done with your head, neck, and spine in line and with firm arms. While it may look difficult, anyone can master the Bow Pose with proper instruction. The Bow Pose strengthens your back and core while stretching your ankles, abdomen, and neck. In addition to improving your paddle strength, the Bow Pose will ease back pain and improve your posture. Lay down on your stomach. Curl your legs upwards while reaching back with your hands. Grab your ankles with your hands so that your body is bent like a bow. Hold for 20 to 30 seconds. The Locust Pose may just seem like a simple back bend, but it can strengthen the muscles around the spine, the buttocks, and the back. Making it a useful pose for surfers for both pre and post surf yoga sessions. Lay on your stomach with your arms resting at the sides of your torso and your forehead on the floor. Turn your big toes towards each other to inwardly rotate your thighs. Exhale and lift your head, upper torso, arms, and legs away from the floor. Only your lower ribs will remain in contact with the floor below you. Raise your arms parallel to the floor, stretching them backward. Gaze forward or slightly upward to keep the base of the skull lifted and the back of the neck long. Try to hold this pose for 30 seconds to a minute. The Balancing Table Pose will engage your core, upper back, and shoulders, making it one of the best poses for paddle strength, coordination, and core strength. Begin on your hands and knees in the Table Pose. Inhale, and reach your right leg back, extending your toes to the direction behind you. Your leg should be parallel to the floor. Inhale once more and bring your left arm up parallel to the floor. Hold for 3-6 slow breaths, exhale as you release. Repeat on the other side. A variation of Downward Dog, the Extended Puppy Pose stretches the upper back, spine, and shoulders while opening the chest. This pose also aids in the release of chronic tension in the neck and shoulders, making it the perfect addition to your post-surf cool down yoga session. Begin in Tabletop (on all fours, with your hips directly over your knees and your shoulders over your wrists) Rest the tops of your feet on the floor with your toes pointed straight back. As you exhale, begin to walk your hands out in front of you. Allow your chest to sink towards the floor as you slowly release your forehead to the ground. Press your palms firmly into the mat or the ground, and roll your elbows outward, keeping your palms on the mat. On your next inhalation, deepen into the stretch by reaching your hips up and back toward the wall behind you. Continue to let your chest sink down toward the floor. Breathe deeply for 5-10 breaths, release the pose by walking your hands back to the Table Top position. Cow faced arms will help alleviate shoulder pain, specifically any rotator cuff impingements. If you have any sharp shoulder pain after a long day of surfing, this is the pose for you. While seated on the floor with crossed legs, grab a towel with your right hand, inhale your right hand to the sky. As you exhale, drop your right hand towards the back of your heart and reach up with your left hand to grab the dangling towel. Release roll out your shoulders and repeat on the left. You should feel a gentle stretch on the front of the shoulder on the arm that is behind your back. Hold the pose for 30 seconds and then switch sides. The Four Limb Staff Pose builds the upper body and core strength necessary to surf successfully. Additionally, it lengthens the spine and strengthens the lower back muscles. Begin in a push-up position, with your fingers spread apart and a flat back. Exhale and keep the body in a straight line as you lower yourself downward, stopping 4-6 inches above the floor. Bracing yourself with your weight forward above your palms, hold the position with a 90-degree bend at the elbows. Keep the shoulders at the same height as the elbows. Breath 1-4 breaths Release back into the push-up position or to a resting position on the floor. The Kneeling Crescent Lunge will help release your tight hips after a long surf. The pose stretches the lungs, hips, neck, and abdomen. With one foot in front of the other, begin in Warriors pose and lower the back knee to the ground. The front knee should be bent at a 90-degree angle, aligned with the ankle, the back knee should be pressed firmly into the floor. The hips are squared and pressed forward so there is a slight stretch on the hip flexors. The arms should be lifted and come together above the head, with hands together or apart. 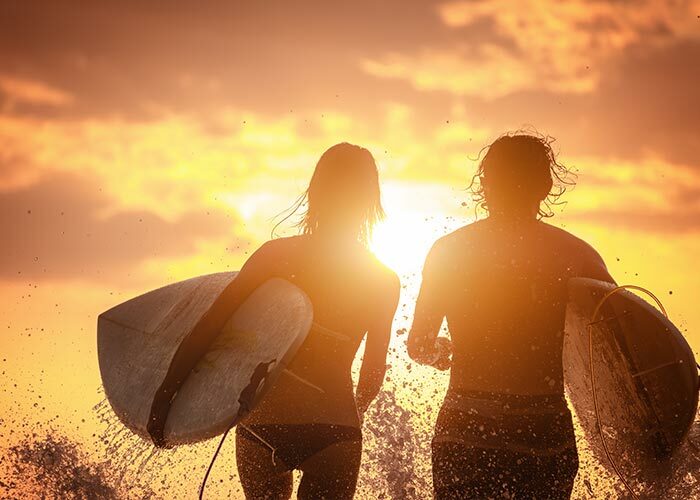 Whether you’re looking to take a surf yoga holiday or simply stay limber between paddle outs, Swell Surf Camp will give you the yoga and surf instruction you need to make the most out of your surf holiday. We offer 3 yoga classes per week for Swell clients. 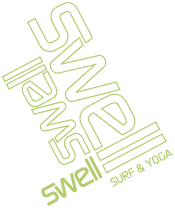 More info on the Yoga classes offered at Swell can be found on this page. A:Molly’s ( The Yoga Instructor at Swell) teaching style is warm and supportive and she encourages students to explore beyond their perceived limitations by emphasising proper alignment to maximise performance and prevent injuries. You do not have to be a regular practitioner of Yoga to take and enjoy a yoga class at Swell.